There are a number of different Beautyrest models. The World Class sits somewhere in the middle with respect to features and cost. All the Beautyrests have pocketed coil springs (some have different #s of springs) and have varying configurations of high performance foams, visco memory foam or latex foam. The Black has a few other bells and whistles. The Beautyrest World Class uses 980 pocketed coil springs (measured on a queen) which is more than the Classic and the Anniversary but less than the Exceptionale. Coil count for the Twin is 594, the Full 825, and the King is 1260. It has 3 inches of high density foam around the edge of the mattress to provide solid edge support (good edge support has been mentioned by consumers). Comfort and support are also provided by layers of premium foams, memory foam and latex foam. The World Class, like other Beautyrests, is a no-flip mattress and it comes in Firm, Plush or Pillow Top comfort/support options. The Firm mattress uses thicker wire gauge in the coils, the Plush mattress uses thinner wire gauge coils and has additional foam layers on top of the coils, and the Pillow Top uses additional layers of foam in the top mattress material creating a soft pillowy mattress surface. There is a huge range of Simmons World Class mattresses on Amazon should one wish to check out features and pricing. Several quality sources indicate the following consumer sentiment and ratings for the Simmons world class beautyrest mattress. It appears that many consumers were very happy with the mattress at first but over time became less enthusiastic as the mattress began to feel lumpy and/or developed depressions. Some still feel the mattress is comfortable and a good buy but there are a large number than indicate the World Class Beautyrest simply breaks down in a short time. Macy’s sells the Simmons Beautyrest World Class "Angelique" Extra Firm Mattress. 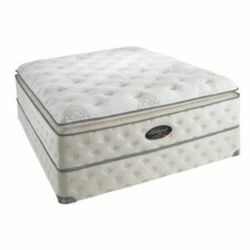 This particular World Class Beautyrest get ok reviews and 16 consumers have given it an average of 3.5 stars out of 5. Those who were confident they really needed an extra-firm mattress seemed to like this one. However it seems that a number of people felt that the mattress that they demo’d in the store was not as firm as the mattress they were delivered. These people indicated that the mattress delivered was far too firm and as a result rather uncomfortable. This seems to be a love it or hate it mattress. Do you have this mattress? Do you have any comments or input you would like to share with others? We welcome comments!